Holds up to 25 C7082 clocking cards. Time card sizes 85mm x 140mm. 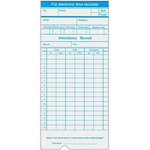 Time card sizes 85mm x 185mm. Wipe clean, ideal for food preparation areas. Wall mountable with 2 x fixing slots. Keyhole hanging slots for easy removal from the wall. Number labels for slot numbering.